Make your car more distinct by using this Bell Steering Wheel Cover! With a simple yet attractive design, this covering matches the Baja Blanket seat covers and adds a classic style to your ride. The car steering cover is easy to install, making it convenient to use on most vehicles. Simply slip it into place and it is ready to be used immediately. This product is also designed to work with a wide array of vehicles. 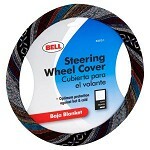 Made of 100-percent polyester, the Bell Steering Wheel Cover is long lasting. The material is also soft and comfortable to hold for extended periods. Durable stitching adds to the life of the cover, supporting it through heavy use. 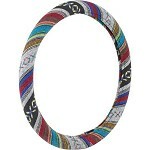 The textured feel of this product enhances your grip on the steering wheel while driving. The Baja Blanket car steering wheel cover has multiple colors and patterns that add to its beauty and helps make your car unique!